Our End Slavery ministries seek to Loose the Chains of Injustice (Isaiah 58:6). We are growing ministries across the globe addressing a broad spectrum of needs to end slavery from prevention to support and restoration of those enslaved. There are an estimated 27 million slaves in the world today more than at any time in human history. An estimate 800,000 people are trafficked across international borders each year. Approximately 50% of all victims are children. 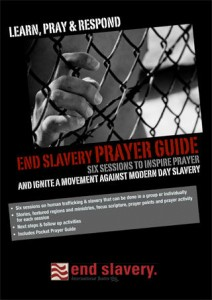 End Slavery Prayer Guide Download this six session tool to inspire prayer and ignite a movement against modern day slavery. The guide includes stories, featured ministries, prayer points, next steps, follow-up activities and more. iTeams is working in End Slavery ministries in a variety of countries and contexts around the world. Read what iTeams is doing to help End Slavery in Cambodia, Greece and Thailand, as well as how you can be involved personally. Click for resources on Thailand. If you’d like to keep updated with practical stories, opportunities and prayer requests regarding end slavery, please fill in our contact form and specify End Slavery Prayer Network. Click here to view a sample of our Network newsletter.